In accessible prose for North American undergraduate students, this short text provides a sociological understanding of the causes and consequences of growing middle class inequality, with an abundance of supporting, empirical data. The book also addresses what we, as individuals and as a society, can do to put middle class Americans on a sounder footing. "Middle Class Meltdown in America is an excellent source for graduate and undergraduate course on inequality. The book is well written and accessible to students. I have used the previous version in inequality courses. It is the students’ favorite book. It provides a framework for students to understand what is happening to them and their families." "During the ‘boom’ years of the late twentieth century, middle class incomes stagnated, while middle class debt fueled a period of growth accompanied by rising levels of inequality. Even as the Great Recession makes the consequences of this unstable equation apparent, standard economic accounts tend to obscure more than they explain. But Leicht and Fitzgerald’s empirically grounded sociological perspective moves beyond the limits of neo-classical logic. Middle Class Meltdown in America is an engaging and critical analysis of the false promises made by 40 years of neo-liberal political and economic practice. Required reading for any student of our continuing economic crisis." "Middle Class Meltdown in America is a student-friendly analysis of the Great Recession, growing economic inequality, the erosion of the middle-class, and the long-term consequences of these economic changes. Rather than wallowing in the hopelessness of such changes, their final chapter ‘Manifesto for the Middle Class,’ empowers students to fight such changes by offering both practical individual and collective responses. A powerful message for a time of crisis." "In the wake of the financial crises, Middle Class Meltdown in America provides a clear, compelling story of the middle class’s shift from comfortable to vulnerable. 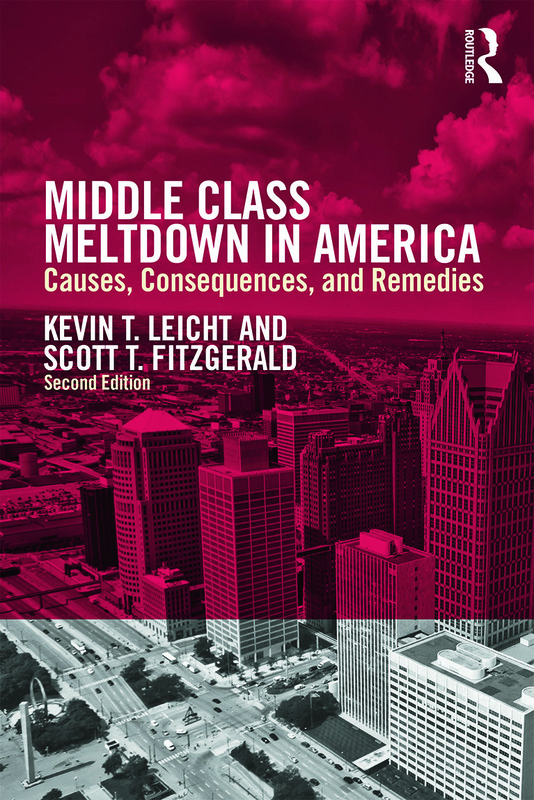 Leicht and Fitzgerald convincingly trace the crumbling of the middle class in America, and explore solutions to restoring middle class prosperity. The book’s melding of data and policy produces insights that will spark discussion and debate." "The middle class is in crisis in America, but why? Middle Class Meltdown provides the answers. Leicht and Fitzgerald show how deteriorating job opportunities and expanding credit have stretched family finances to the breaking point. They pinpoint the institutional changes and political decisions that led to the middle class squeeze, and pose innovative solutions. This book is required reading for anyone concerned about the middle class in America." "This is a highly original, engaging, intriguing, and well-written book on social stratification. It is original in implicitly comparing American pro-capital, anti-labor ‘unfettered’ capitalism to European master-servant feudalism, plutocracy in contemporary America with aristocracy in feudal Europe." Kevin T. Leicht is Professor and Chair of the Department of Sociology at The University of Iowa. His research examines the relationship between globalization, economic change, and social inequality in a variety of contexts. His work has appeared in the American Sociological Review, American Journal of Sociology, Social Forces and the Academy of Management Journal and former editor of The Sociological Quarterly and Research in Social Stratification and Mobility. Currently he serves as President-Elect of the Midwest Sociological Society. Scott T. Fitzgerald is Associate Professor of Sociology at the University of North Carolina Charlotte. His research examines social and economic inequality, social movements, public policy and religion and has appeared in Social Forces Mobilization: An International Journal Sociological Spectrum and Policy Studies Journal. He is currently the Political Sociology co-editor of Sociology Compass.